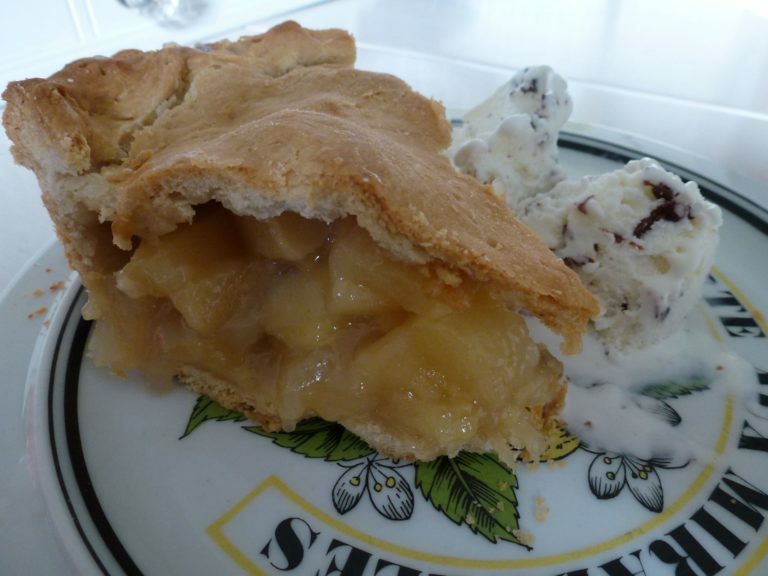 “As American as Apple Pie” was a slogan adapted at the start of the second World War. Though the apple itself is a visitor to our soils, we can thank the early European settlers from England mostly, who brought our breeds of today’s apples over the ocean with them. Crabapples were the only sort of ‘apple’ native to the America’s. It’s taken 300 years to literally spread the seed of apples across our vast land, but it was done indeed. Apples are more of a folklore heritage to our country. From Johnny Appleseed, to the phrases of American history, “An apple a day keeps the doctor away”, to “As American as apple pie”, one would think we were the king originators of apples. But, now we know we were not. Though we may not be the kings of apples (originally), we are the kings of pies. Pye as the English used to spell it, is another gift those exuberant English colonists brought with them. They were the master of pies some several hundred years previous. Well, now, America has just about caught up, or maybe even surpassed the Brit’s with their pie baking expertise. You’ll find pies are regional. It seems the Southern parts of the U.S. tend to do pies a bit more elegantly than us western folks from California. 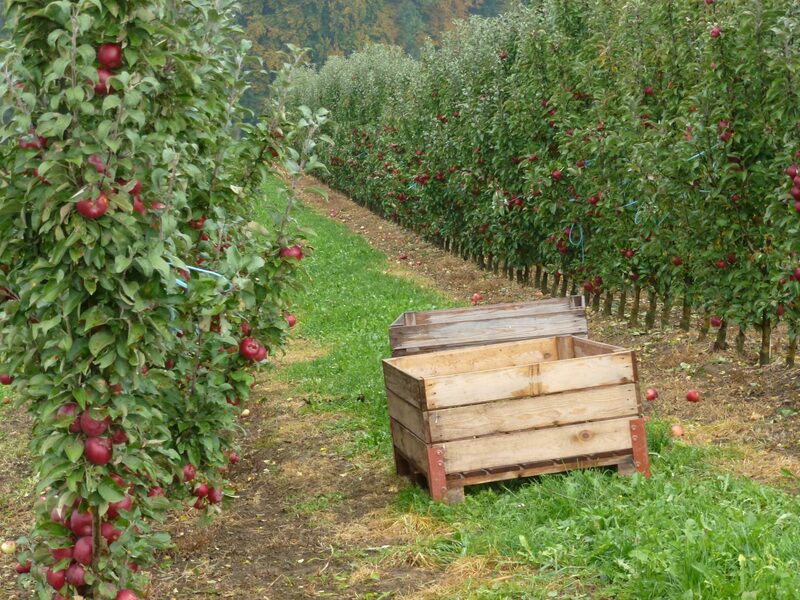 We have a simpler approach, and a better climate for apples in the west. We like the many variations of apple pie, apple croissant, apple sauce, apple crumble, and yes, apple jelly. But, we’re here to talk about the Apple Pie. 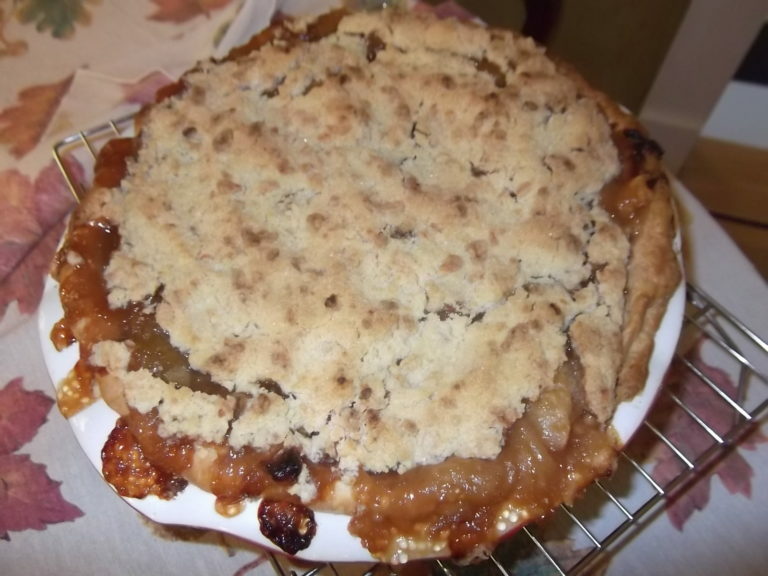 This heritage apple pie recipe is delicious. My mom’s been making pies for decades. I’m happy to report, she’s an EX crisco user. If it’s one thing I remember from the 70’s was Crisco. My mom always had a tub of it around, and it was always used for her pie crusts. Today, we’re off crisco (thank god!!!) and on butter. Is the apple pie more about the crust or the apple? I say, it’s a run-off. Both are of equal value. 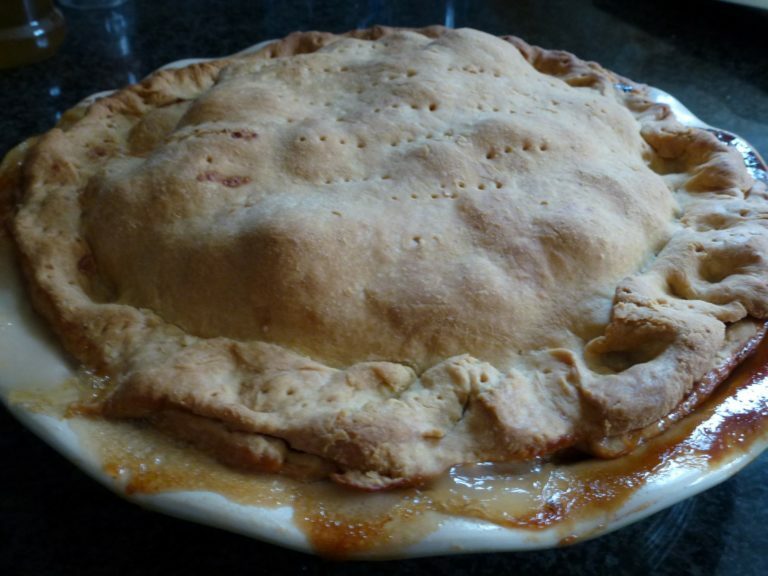 For a phenomenal crust recipe, try the crust from my “Caramel Apple“, it’s stunning! For the filling, I like my apple combination to contain a lot of cinnamon, and never any raisins! I’ve also found not to be picky about my apple variety for the pie. It seems sometimes it’s sweet, sometimes it’s bitter depending on the assortment I have on hand. One thing for sure, be sure it’s always organic! Apples are sadly sprayed quite heavily, both here in Switzerland and in America. Even though we peel the skin for pie, doesn’t mean you dodge the chemical bullet. These chemical’s simply and completely penetrate the skin of the apple. 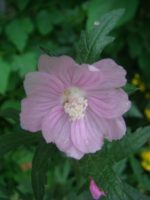 It just comes down to a moral choice to avoid chemicals at all levels. It’s no longer a matter of “if you can”. It’s now a matter of “you must”. A delicious and simple apple pie-one which you can hopefully use when you have too many apples. Combine salt, and flour. Slice small pieces of the cold butter into your flour mixture. Begin to combine and add the cold water as you need. You will begin to bind the dough and you will work it as little as possible, due to the heat from your hands making the butter melt. This is a quick process to combine and smooth the dough. Once you have achieved the binding and desired moist texture, roll out and lay into your pie pan. After your apples have been peeled, cored, and sliced, combine with sugar, cinnamon and flour. Mix around in a bowl, and then pour into prepared pie pan with the pastry dough below. You can either decide to cook it open face w/ a crumble mixture on top, or lay another layer of pastry dough on top. Bake: 375°F for 50-60 min. Or until crust is a perfect golden brown. Let cool, so the filling will thicken. Also, another version is the apple crumble. Make pie the same, only no top crust. Instead, make a crumble with butter, flour and cinnamon. Generously add crumble to the top and bake. Here’s what you get! Simply delicious. My Apple pie turned out great! Still working to perfect my pie dough but will give it several more shots. This crust was flakey and light and the spices made it so flavorful. My house smelled amazing!! This pie is a treat!